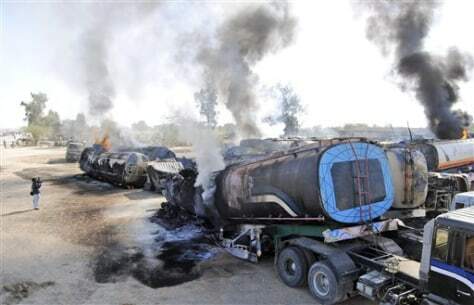 A Pakistani cameraman films burning oil tankers after gunmen attacked a terminal in Dera Murad Jamali southwest Pakistan on Saturday. A government official says gunmen in Pakistan's southwest have set ablaze 14 tankers carrying fuel for U.S. and NATO troops in Afghanistan. A driver also was wounded during the Saturday attack.